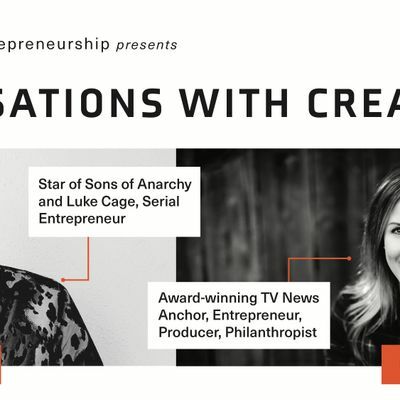 Join the Pathways to Entrepreneurship program for an interactive workshop with Theo Rossi, a serial entrepreneur and star of "Sons of Anarchy" and "Luke Cage", and his wife Meghan Rossi, an award-winning television news anchor, producer, entrepreneur, and philanthropist. 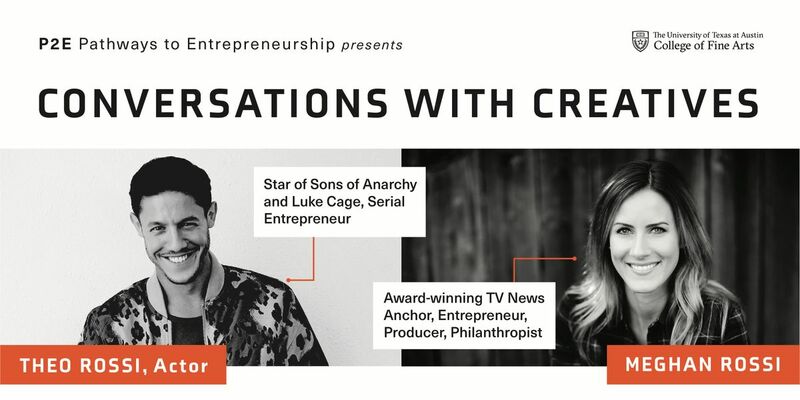 The pair will be discussing their respective entrepreneurial journeys. Theo Rossi is an actor, producer and philanthropist who currently stars as ‘SHADES’ on Season 2 of Marvel’s “Luke Cage” for Netflix. Rossi formerly played the fan favorite “Juan Carlos ‘JUICE’ Ortiz” on the critically acclaimed television series “Sons of Anarchy” on FX. Rossi studied acting at the prestigious Lee Strasberg Theater Institute in New York. Throughout his acting career, he has showcased his versatility starring in a multitude of projects including “Grey’s Anatomy”, “Lost”, and "Law & Order: Special Victims Unit," and films "When the Bough Breaks," "Bad Hurt," and “Cloverfield" to name a few. Rossi formed the New York-based production company, Dos Dudes Pictures, which released the award-winning and critically acclaimed feature film, “Bad Hurt”, in theaters in 2016 and the “Right to Be Me” PSA to advance equality and understanding for persons with disabilities. In the midst of his busy work schedule, Rossi makes it a point to carve out time for his philanthropic work. He founded GoGetItLIFE in late 2014. The brand encourages a healthy, positive lifestyle through its active online blog community and social media engagement, in addition to its 5K Race Series held annually throughout New York City. Proceeds from GoGetItLIFE are donated to charities close to his heart. In the wake of 2012’s Hurricane Sandy, Rossi founded StatenStrong to rebuild his hometown of Staten Island, NY. Through StatenStrong Rossi organized a team of volunteers who rebuilt three homes and provided more than $500,000 in emergency assistance to affected families. Rossi’s other charitable endeavors include being an Advisory Board Member for the Garden of Dreams, the nonprofit arm of Madison Square Garden. He is also an Ambassador with Boot Campaign, having hosted several fundraisers for the nonprofit, in addition to visiting several U.S. Military bases, including a USO trip to visit troops serving in Iraq. Rossi has served as a Humane Society Ambassador since 2014 and was featured in a Humane Society campaign focusing on education and support programs for the more than 300 million street dogs worldwide. Since she was a little girl Meghan has had a calling to connect. Whether that is as a story-teller, promoter or in service to others. Meghan is an award-winning Television News Anchor, Reporter, and Producer. Her journalism experience dates back to high school when she began as an intern at KPRC-TV in Houston, TX. She continued interning at KPRC-TV while completing her Journalism degree at the University of Houston. Meghan later worked on-air at KTEN-TV and CBS 19. After a brief stint heading Platinum Advertising while concurrently serving as Contributing Writer/ Account Executive for BSCENE Magazine, Meghan ventured into one of her proudest professional achievements to date. In 2010 Meghan became an integral part of the launch team for the Boot Campaign. Five years of lacing up her combat boots and working with veterans and their families throughout the United States were some of Meghan’s most inspiring and teachable years. Today, the Boot Campaign is one of the nation’s premier 501c3 organizations to honor and support military veterans and their families. It was during her time with the Boot Campaign that Meghan met her husband, Theo Rossi. With a combined strong entrepreneurial spirit and shared philanthropic focus, together they formed two companies – Go Get It LIFE and OUNCE WATER. Go Get It LIFE is a positive lifestyle brand that encourages you to live your best life. Meghan manages a robust international blog and social media platform. Through this company she and Theo give back to charities, hold annual kindness campaigns including the Gratitude Challenge and Happiness Effect, and produce 5k runs that benefit non-profit organizations. OUNCE WATER is a premium bottled water company founded by Meghan and Theo with headquarters in New York City. OUNCE WATER is a display of the couple’s artistic, advertising and health/ wellness attributes. OUNCE WATER promotes the benefits of adequate hydration, in an industry radical label design. Meghan also serves on the Dos Dudes Pictures team, a film and television production company founded by her husband, Theo. She’s always had a calling to serve others. Whether it was bringing home stray animals or spending her high school summers traveling the country to volunteer for Habitat for Humanity or the Boys and Girls Club, or serving on the board of nonprofits such as ASSIST Autism Foundation, the Junior League of Tyler, Louie’s legacy or the Humane Society to name a few. Giving back is at the core of what she finds most important. Always dedicated to serving her local community, Meghan is on the event planning committee for this year’s Boys’ and Girls’ Club Gala to be held this fall in Austin, TX. After several years in New York City, Meghan now lives back home in Texas with her husband, Theo, their two sons Kane and Arlo, and their three rescue dogs Benny, Sasha and Rocco. Parking can be found in the San Jacinto parking garage, more details here: https://facilitiesservices.utexas.edu/buildings/UTM/0551.